Common Area Phone is really cool feature introduced in Microsoft Lync Server 2010. What is meant by common area phone? In the context of this article a common area phone is a Polycom phone device located in an area such as a cafeteria, hotel/office lobby, meeting room or even a security entrance phone. It is a phone device located in an area where multiple people, whether authorized users or not, have access to the phone and the phone is not dedicated to a specific user. Target goal is to convert existing Polycom SoundPoint IP, Polycom VVX phone to Common Area Phone without need to purchase additional phone devices. The DHCP 004/042 options (Time Server). Although the time server location will provide the accurate time required to perform authentication and registration processes the phone will display the time in GMT by default. To show the correct local time on the phone’s display the standard time offset DHCP 002 option (Time Offset, optional) can be used. Phone ability to sign in via PIN authentication. It is possible to start internally with Common Area Phone and then take the phone off-site, but if the user signs out or the client certificate expires (or is revoked by the server) then the phone won't be able to connect again without bringing it back inside the network. If we are in the process of deploying a phone in a common area we will most likely want to disable some of the default features (it is not strict prerequisite but rather recommendation), functions and physical ports on the VVX/Soundpoint IP. Put these parameters into your XML configuration file that will be uploaded to the phone via Polycom provisioning server or via the WebUI of the phone. New-CsCommonAreaPhone -LineUri "tel:+12065551219" -RegistrarPool "pool.contoso.com" -OU "OU=Phones,dc=contoso,dc=com" -DisplayName "Building 14 Lobby"
You can also use UI based tool called "Lync Common Area Phone Management" tool. 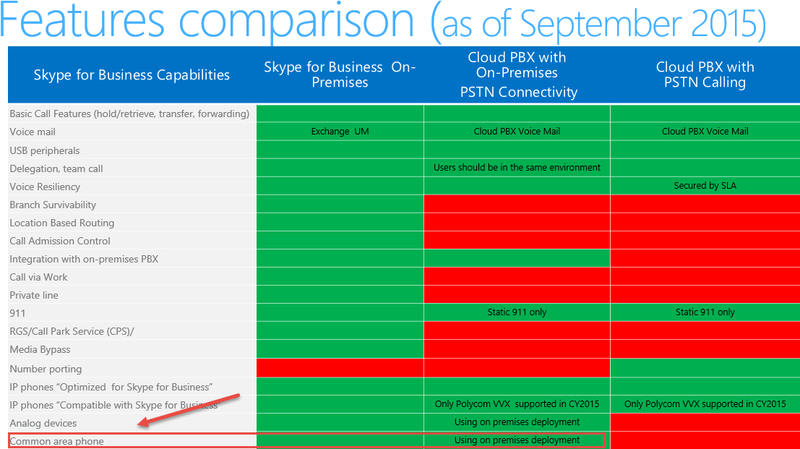 The tool was successfully tested with Skype for Business Server 2015. Another cool feature introduced with Common Area Phone called Hot-Desking. You can set up Common Area Phones as hot-desk phones. 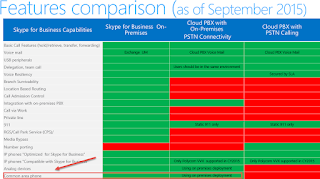 With hot-desk phones, users can log on to their own user account, and, after they are logged on, use Skype for Business Server features and their own user profile setting. Grant-CsClientPolicy -Identity "Building 14 Lobby" -PolicyName "CommonAreaPhonePolicy"
Per my understanding phones of other vendors may behave like Common Area Phones. Just check if they support PIN authentication.